A roof rake is an awesome tool for roof snow removal. The five best roof shovel products reviewed and compared. A roof rake is another extremely handy winter hand tool - much like a snow shovel. There's a lot of similarities between the two, the main difference being the fact that roof rakes are semi-flexible and used for the removal of snow from the roof. Making use of a snow rake for roofs is a good preventative measure when it comes to ice dams - and the resulting damage they can cause. A metal one will deal with both ice and snow and whilst we'd all like to get the snow blower up on the roof - they're hardly practical for snow clearing at height. The five best snow roof rakes are featured below - the best value for money rakes, the best selling examples and the most highly rated overall. This is the best selling aluminum roof rake by a long mile and it's easy to see why. The overall manufacture if superior and the reach you get with the Garelick is extremely impressive - plus when used at its full extension it remains as user-friendly as it does on the shorter lengths. It removes snow from the roof and eaves with relative ease, with the added benefit of reducing the likelihood of ice-damage setting in over the winter months. The blade is a generous 24" wide and the weight is good enough to make short work of snow removal, without being heavy enough to cause drag on the arms and shoulders. There's a few grips in relation to it being flimsy - which is an easy fix. Simply use stainless steel nuts and bolts when assembling it. Used when the first snowfall hits you really will save yourself some expensive roof repairs further down the line. Highly recommended. 21' Long Roof Snow Rake, Extra Large Blade 7" x 24", With Poly Roller Glides, All Lightweight Aluminum. This is the best plastic roof rake and comes from the well known brand Suncast. A trusted name, the Suncast has a good width to the blade, 24", is lightweight enough to use at its full extension yet rugged enough to deal with the task at hand. The blade won't damage shingles and the initial assembly is pretty straightforward. If you've ever experienced the trouble that ice dams bring with them, you'll appreciate the use of a good quality roof shovel such as this one. A snow rake removes the potential damage associated with roof snow over the winter months and they're a highly recommended purchase. With a little over 20ft of reach, this is one roof snow shovel that will take the 'hard' out of hard-work. Resin coated aluminum lower handle. Plain aluminum upper extensions. Cross braced blade. No stick graphite blade. Length: 21'. Blade: 24'' x 7''. If you want to shovel snow off the roof, the sturdy design of the Midwest Snow Rake will get the job done in a snap. This is one for those with a single story home as the reach is a mid-length 16ft. However, what it does do is adequately remove snow without complaint - and it's pretty easy to put together out the box. The design feels durable enough for the removal of several inches of snowfall at a time and aluminum manufacture it's not difficult to maneuver around the roof. There are three separate sections which make it flexible for shorter/longer reaches and the aluminum blade will, on a shorter handle, deal with ice easily enough. A good quality roof ice rake product and currently on offer at a reasonable enough discount to make the purchase worthwhile. 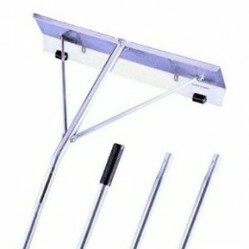 22'' aluminum roof rake removes snow from your roof while you are at ground level. Prevents damage due to heavy snow loads. Features 16' 3 piece snap pin handle. This is an alternative to the usual roof rake designs - when it comes to snow roof removal the design is incredibly innovative and it's a breeze to use. The usual labor associated with roof snow shovels is lessened yet more by the way in which it works. You simply position the Avalanche where you need it and the snow comes sliding right down the chute - awesome! The slider is 17" wide and the whole manufacture is lightweight and easy to work with. The handle extends the reach up to 16ft, which makes it adequate for single storey homes, and the slide itself is a decent 8ft. The wheels that are positioned at the head of the slide prevent damage to the shingles and overall - when used on new snowfall, it's incredibly impressive. Cool, unique, gets the job done - worth every cent. This is a five star rated product and another of the five best roof rakes on the market. Well received by previous purchasers, the manufacture consists of a flat shovel head that you slide beneath the snow, around the roof edge. The snow simply slides over the shovel, off the roof - result. It's incredibly lightweight at 2.4lbs, the shovel is polyethylene and the handle a sturdy aluminum construction. The reach when fully extended is a generous 20ft and used as per the instructions, the Sno-Knife will help prevent damage from the build up of ice dams - plus it won't damage the roof when in use. A great product, well designed, user-friendly and worth the purchase price. Organizing your closet doesn't always have to be a chore. This guide will show to how to organize your closet easily and make more space.